Hi everyone, Micki here. I watched this wonderful video from Journal Girl in which she shares a tip on how to use your Gelli Plate like a stamp. 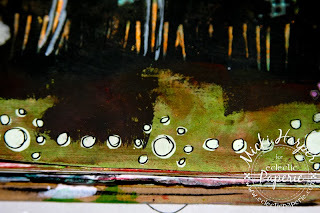 I love using papers with the Gelli Plate, however sometimes I just don't want to add extra papers. So I knew I had to try this tip. 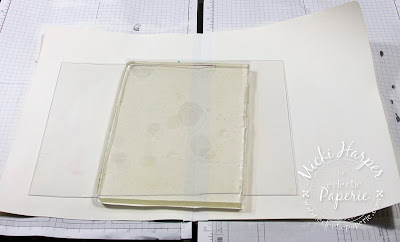 Get a piece of Plexiglas and place the Gelli Plate on top of it. I will say that I was hesitant to flip it over, but it worked. 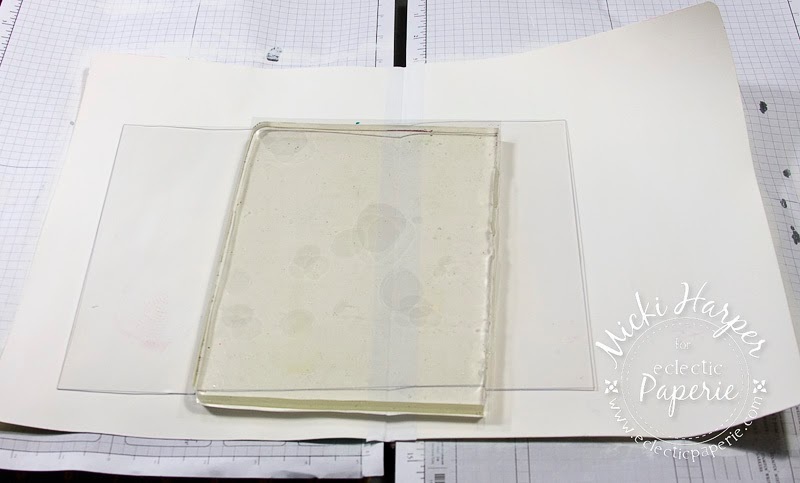 The Gelli Plate will stick to the Plexiglas and since the Plexiglas is clear you can see where you're going to stamp your print. After covering the plate with paint, I added a stencil and flipped it over directly onto my art journal page which had previously been covered with gesso. Depending on the stencil, the Pink Paislee Doodle Stencil has a lot of intricate design, which meant I had to apply more pressure when stamping the plate. 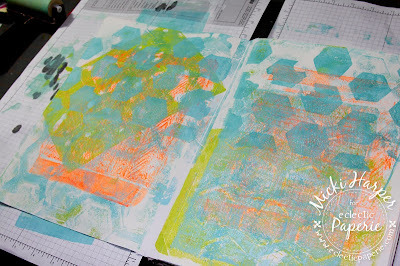 But other than that, the other stencils worked great. Now what to do with those two pages. For some reason, I am thinking flowers, green grass and blue skies - probably because we are having temperatures in the 60's and then it's supposed to drop to a high in the low 20's. That will make anyone wish for spring time colors, right? 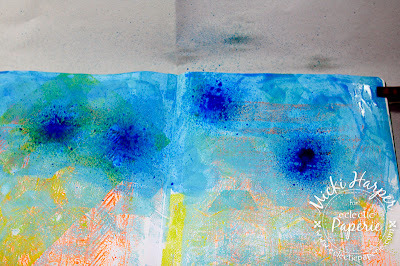 With that in mind, I dabbed on Salty Ocean Distress Paint, misted with water and distributed it using a brush. 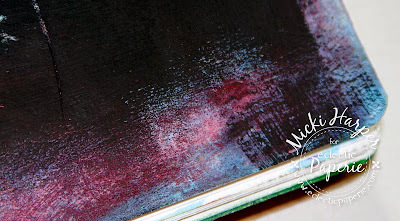 Next I used my Dylusions Ink Sprays, spritzing the upper part of the pages with the different blues, misting with water and after turning the journal this way and that, used a brush to add swirls (and cover the area I wanted covered). 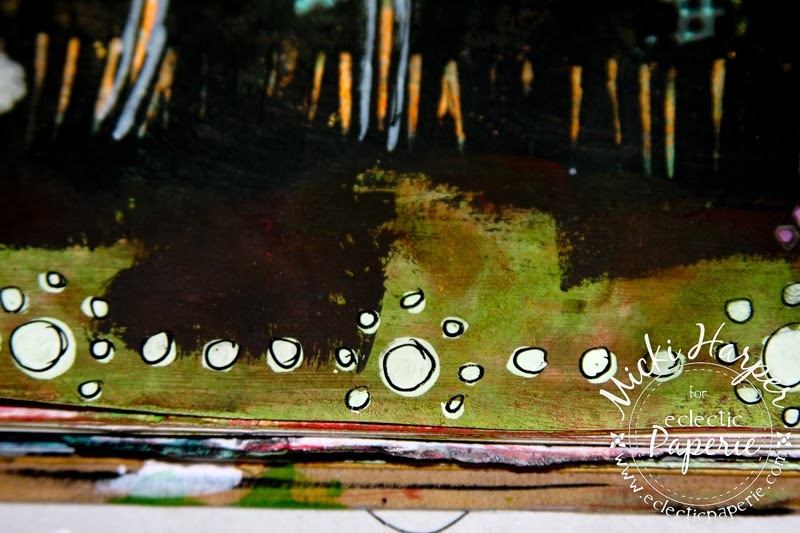 I did the same thing on the bottom of the pages using Distress Paints and Dylusions Ink Sprays. 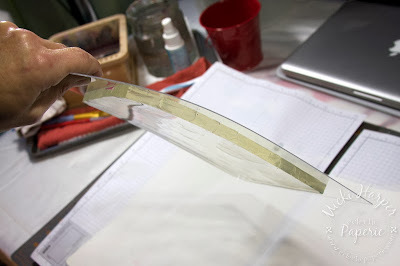 And then.....another idea (not always a good thing). Remember those Light Brights I think they were called? 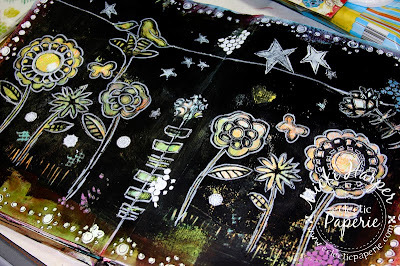 I covered it all with black paint and not in a very pretty way. 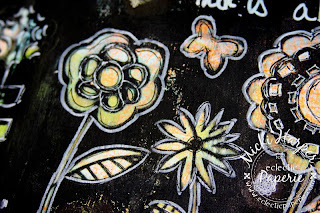 I laid my flower stencils over the still wet paint and did a stencil resist using a wet baby wipe to remove the paint through the stencil. It took several wipes and I'm still carrying the effects on my fingers :-). That result ended up a little too red, so I toned it down by lightly wiping along the edges with a wet (almost dry) baby wipe. I doodled around the flowers with my white Faber-Castel marker and in some instances doodled some more with a black pen. I'm horrible at doodling. I think it's because I'm ambidextrous, I write with my right hand but can sketch and color with either right or left hand. It confuses my brain I think :-). Regardless, because I don't like my doodling, I'm more determined to do it. 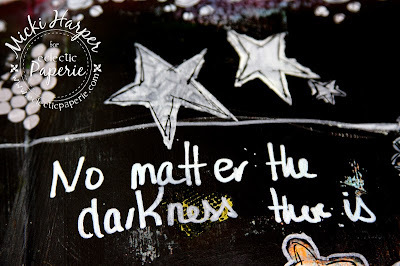 Anyway, I added white stars by using Dylusions Starry Night stencil, outlining and filling in with my white marker followed by outlining with black pen. I did the same for the border using the border part of Dylusions Letter Jumble stencil. To finish this spread, I added rub-ons and wrote the first thing that came to mind: "No matter the darkness, there is beauty." Mental note to self, remember to think about spacing. 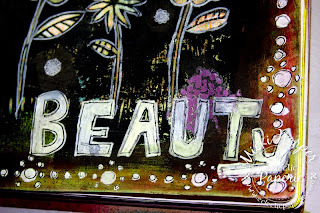 Had to improvise on the word BEAUTY. 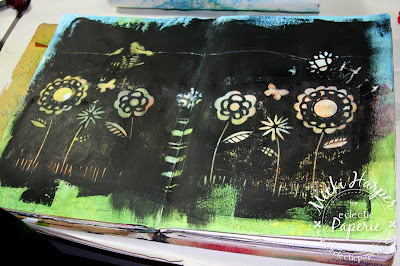 My journal spread, which ended up totally not as I had expected. But that is so me and your art journal should be a place to experiment, right? Oh Micki - Baby Wipes are one of my favorite art tools!! 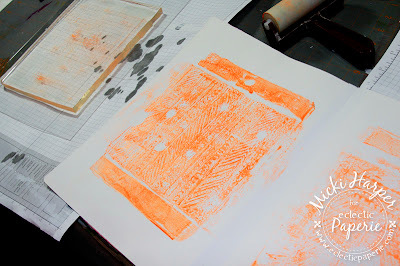 And I love how you used your gelli plate as a stamp!! FUN! 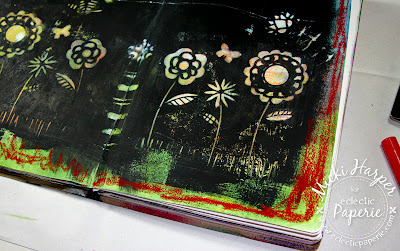 Think I will pull out my gelli plate and play today!! WOW Micki!! 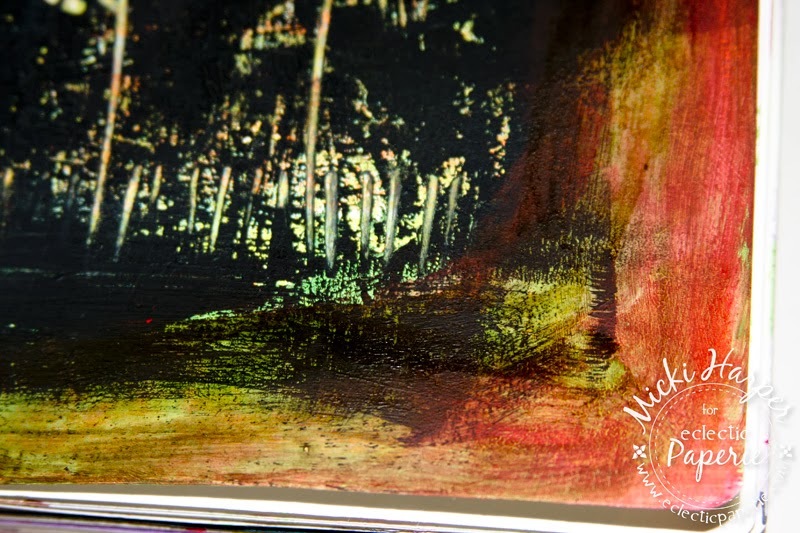 This is a piece of art! Fantastic. This is totally awesome, Micki!! 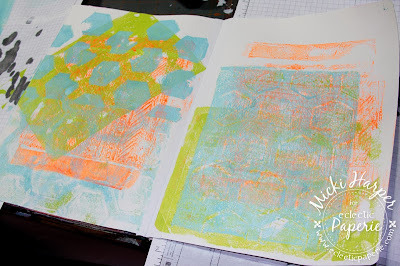 I never thought of using the Gelli plate that way! Too cool!! 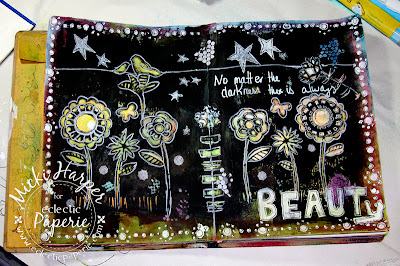 I am in LOVE with your journal pages! 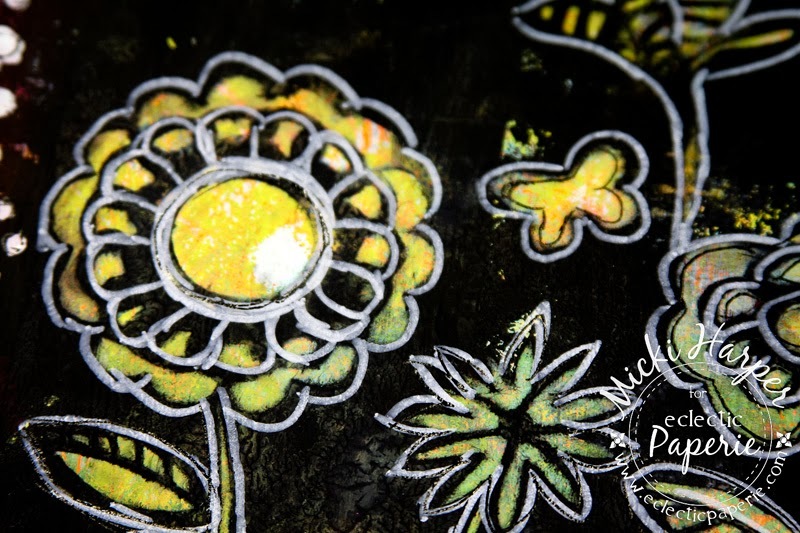 LOVE the black lite bight BG and LOVE your doodling! What a FAB sentiment, too! Oh my gracious, this is amazing!!!! 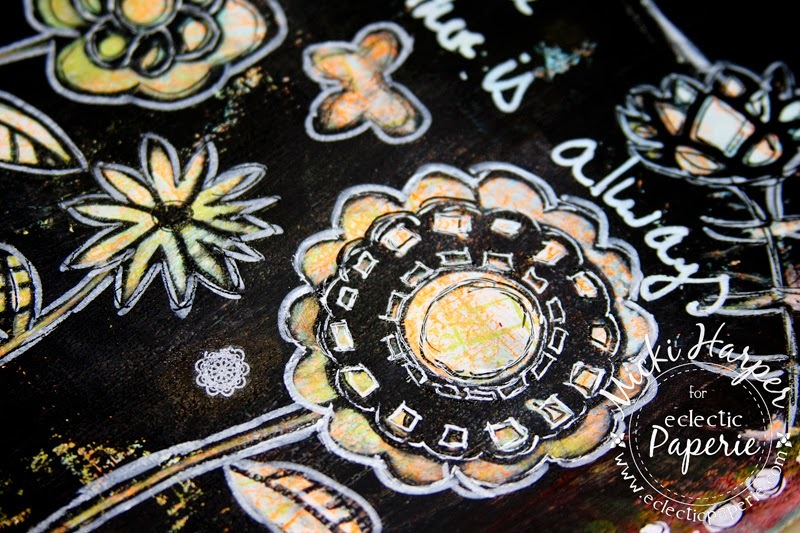 I absolutely love the background colors through the black!